Set in a time and world in which slavery and sacrifice are a way of life for many. Betrayed by one of his own clansmen, Azarion was sold into slavery where he has earned a reputation as the fiercest of gladiators. His patience and perseverance are about to pay off, however. Gilene has a gift for illusion--and for controlling fire. For years, her village has made her their annual sacrifice. The empire has no idea she is the same woman sacrificed by the village each year. She expects this year to be no different. Only, Azarion knows her secret. He is able to see beyond her disguise and plans to use her to gain his own freedom and reclaim the birthright of his clan. This is my first novel by Grace Draven, and I was impressed with the detail of her world building and the depth of her characters. Both Gilene and Azarion are hardened by their life experiences, not trusting anyone, and bent on their own survival. I really felt for Gilene and her situation. She really was between a rock and a hard place. Wanting to protect her family, resentful of the position she's been put in by the villagers, and suddenly all that is threatened by Azarion. While I did not completely agree with Azarion's methods, it was easy to understand why he turned to blackmail to get what he wanted. He had been tortured for years by the Empress, forced to kill in fights, and betrayed by his own clansman. He longed to return to his family and right the wrongs done to him. I was most taken by the two characters plight and their evolving relationship. I would be lying if I did not have a little problem with the growing love between them. Fortunately it was not something that burst forth from the first page. While Azarion realized his attraction to the young woman sooner in the book, it took a long while for Gilene to acknowledge her own growing feelings for him. Considering their positions--that Azarion was basically holding Gilene against her will--I wasn't sure how to feel about the two growing closer. I reminded myself of their situations and the type of world they lived in. And I appreciated that the author did not gloss over their circumstances and addressed it head on. Grace Draven had me completely immersed in her characters and their plights. I wanted so much for both Gilene and Azarion to succeed in their goals and find the peace they deserved. 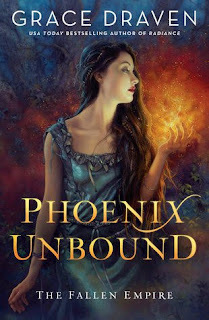 Phoenix Unbound is a dark fantasy that left me wanting to know more about the world Draven has created. I was held in suspense, found myself tearing up at the end, and cannot wait for more. I hope future books will shed more light on Gilene's powers. I feel like her story is only beginning. I'm so glad this was a hit for you. Love the cover. I'm so glad you enjoyed this one, I was sooo hoping you'd do so. I think its one for my Wanna Read list.